THEY DO HOLD AIR. PARTS ARE IN GOOD WORKING CONDITION. HERES A GOOD REAR TIRE 20X8-8 WAS ON A WHITE LT1650 RIDING MOWER. (2) Blades for 42" Cut (ONLY ONE INCLUDED). Replaces Part Numbers: 942-0616, 1032, 335-707, 7-06710, 742-0616, 98-059. Length: 21-3/16". Removed from :White GT-1855 garden tractor Model # 144-998-190. SEE PICS. PARTS ARE IN GOOD WORKING CONDITION. Here is a steering wheel assembly in good used condition. Part # 731-0805 or 931-0806A. Condition; Part is in good condition with normal wear. And ready to be installed. White Hydraulics HB1011530P hydraulic motor. OEM for Bunton PR2204. Manufacture Part Number: HB1011530P. 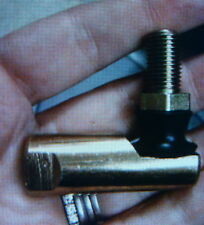 Other mfg/part no: Bunton / PR2204. Type: Hydraulic Wheel Motor. Model: Roller Stator. Detail D: Mount: 4 bolt wheel mount. Mtd white riding mower steering wheel as pictured in good useable condition. Used White GT-1855,GT-2055 Peerless 2510-005B Ring Gear, Differential, Axle Assy 778084 (Ring Gear) 774390 & 774389. Removed from :White GT-1855 garden tractor Model # 144-998-190. Serial Number 6A310I10104 Model 13A-328-190. Used Auger Shaft Bearing and Housing. Model number and serial number required to look up parts. Model number AH5B3H190. Mtd white riding mower trans as pictured in good useable condition. Trans worked great. No excessive wear at top pulley or axle / case area. For sale is the used transaxle removed from a MTD White LC 215 model 12A-969D190 serial 1D087B60264 walk behind lawn mower in good used condition. (2) Blades for 42" Cut (ONLY ONE INCLUDED). Replaces Part Numbers: 942-0616, 1032, 335-707, 7-06710, 742-0616, 98-059. (Only applies for the continental states). Length: 21-3/16". Yardman/White Yard Boss GT 1655 Hood With Hinges. 2010 LT-2200 2 Bladed 46" Deck. Price is per deck wheel kit, you can buy the quantity you need. Fits front deck wheels for. 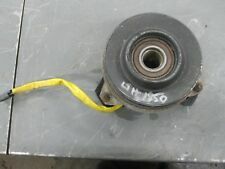 For sale is a used fan and pulley from a White LT125 lawn tractor. Wheel hub, drive sprocket, and axle assembly from White FR-12 zero-turn lawn mower model 137-002-190 with Briggs & Stratton 12.5 I/C engine. BEWARE OF OTHER CHEAPER "Gator Knockoffs". The cheaper ones are not as thick and have less space between the sharp edge and the "teeth". They are the best made blade on the market! This is a set of 3 new blades. Used White (MTD) Garden Tractor Hydro Filter Mount, Removed in working order, Cleaned and ready too use. Check out all My pictures. LOCAL PICKUP AT OUR LOCATION (Ashland,Ohio) Permitted. Not knowing the part you needed. White Outdoor 14A9816K790 (GT-2550H) - White Outdoor Garden Tractor, 54" Deck (2004) - Hood And Fuel Tank. Item was in good working condition when removed from original unit. White Outdoor 13AP61GG897 (P61GG) - Columbia Lawn Tractor, 42" Deck (2009) - Steering Assembly. White Outdoor 13AP61GH897 (P61GH) - Columbia Lawn Tractor, 46" Deck (2009) - Steering Assembly. White Outdoor 13AV61GG897 (V61GG) - Columbia Lawn Tractor, 42" Deck (2009) - Steering Assembly. WHITE OUTDOORS 13AP60TP09 LAWN TRACTOR. MODEL:13AP60TP09 LAWN TRACTOR. UNIT INFORMATION ENGINE INFORMATION -LOCAL PICKUP CAN BE ARRANGED DURING HOURS OF OPERATION. PART #: 751-10609. Item is USED. Tractor Had Kohler Magnum 22HP Engine. Romans 10:9 That if thou shalt confess with thy mouth the Lord Jesus, and shalt believe in thine heart that God hath raised him from the dead, thou shalt be saved. THEY ARE NOT STRIPPED. TAKEN APART, INSPECTED, NEW GREASE. We make every effort to list any defects but you should expect normal wear & tear. Mtd riding mower 717-764 A transaxle upper housing with upper bevel shaft. Condition is Used. For MTDs 1980s and 1990s mtd Upper shaft has splines it's the A version of housing But compatible with older no letter housing just swap upper shaft Nut is rusty but threads are good Shipped with USPS Package. I Have The Clip That Goes On It Also. Good Condition. White Outdoor 13AP62TK090 (SLT-5400) - White Outdoor Lawn Tractor, 54" Deck (2008) - Drive & Pedal System. White Outdoor 13B4516N190 (RD-1750) - White Outdoor Lawn Tractor, 42" Deck (2003) - Pedal Assembly. 54" lawn tractor mower deck kit. All Parts are superseded from the part numbers below. Picture Of Filter Is What Was On It But Not Included. OEM 586-314111 WHITE RODGERS Solenoid 24 VDC 20468G4 - Ships Free ! Model 20468G4. Up for sale is a new White Rodgers solenoid. Not used - new unit.